English nonconformists became increasingly associated with melancholic vapours from the 1620s onwards, as their opponents labelled their beliefs and practices as the fruits of bodily disfunction rather than spiritual insight. While much scholarship has examined the development of these criticisms from the conformist perspective, this paper instead turns to how nonconformists themselves viewed their relationship with melancholy. 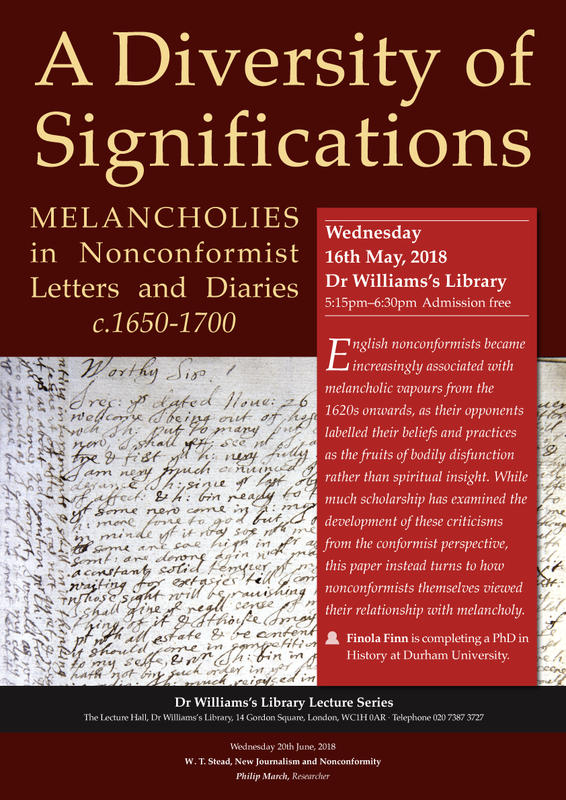 In considering Presbyterian letters and diaries, held at DWL, from across the period 1650-1700, this paper shows that the term ‘melancholy’ possessed a ‘diversity of significations’ in these writings, allowing it to be used for a variety of purposes. Discussion of melancholy - as a distemper, passing mood, or misconceived insult - could, for example, console an anxious convert, imbue troubles with spiritual significance, or critique persecution. Complicating the well-established narrative of melancholy being secularised in the late seventeenth century, this study argues that many Presbyterians continued to use spiritual means to treat this condition, in its various forms, throughout the period. What is more, by using sources such as those available in the DWL archive, and reconstructing the networks of knowledge that surrounded them, it becomes clear that laypersons - as much as ministers and the authors of published works - were active in perpetuating melancholy’s spiritual meanings. Finola Finn is in the final stages of her PhD in History at Durham University, examining melancholy and embodiment in nonconformist religious experience, 1640 – 1700. Her interests are religion and medicine in early modern England; the medical humanities; and artistic approaches to exploring the past, having undertaken her first installation at the UK’s largest light festival in 2017.